One of the best freeware multiplayer games I have ever come across, Gate 88 is a cool "action-RTS" game that features abstract graphics inspired by ABA Games' Japanese shooters (Parsec47, rRootage, et. al. ), combined with nonstop action and an RTS formula that fans of StarCraft will feel right at home with. Your goal is simple: annihilate all the other players on the screen. To do that, you basically upgrade your command ship, build bases, research weapons, and launch massive fleets toward your enemies. Like all good RTS games, Gate 88 is fast, fun, and allows for an amazing range of strategies and possibilities. Epic dogfighting-in-space battles involving hundreds of ships are not uncommon and occur without a hit in frame rates, thanks especially to the designer's decision to use minimalist, abstract graphics that look cool in a Battlezone-like style. One of the best things about the game is that it is being constantly updated with new features. As of February 2005, a new "Alliance" feature was added: this allows players to launch co-operative attacks against their common enemy. This also means that betrayals become a strategic possibility, since broken alliances will cause former allies to suddenly turn against you in a vicious backstab. If you can't find other people to play with, Gate 88 also includes an excellent singleplayer mode (which is also a good way to prepare yourself for the frenetic pace of on-line games). 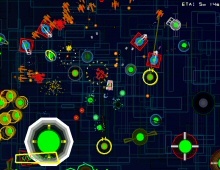 The game offers many customizable practice mode settings, decent AI, and many neat computer-designed ships. The "Stats" feature lets you constantly monitor your performance in both the singleplayer and multiplayer modes. With an excellent balance between strategy and action elements, attractive graphics, smooth animations, intuitive and transparent interface, and above all, addictive gameplay, Gate 88 is a must-play RTS for every action and strategy fan. Highly recommended.